As you pull into this wonderful cabin on the Gunnison River your cares melt away! This special home is set on 2 acres with the Gunnison River running right out your back deck. If you are looking for a place to try out that new fly rod or just relax with the sound of the river, then look no further than Fisherman's Paradise! Only 3 miles North of Gunnison off Highway 135 sits a cabin like no other. As you enter this spacious cabin your eyes are immediately drawn to the soaring ceilings of the great room. The open feel of the combination kitchen, living, and dining makes for many great evenings sitting around talking about "the trout that got away." Directly behind the living area is the large dining table with seating for 6. The fully equipped kitchen with large island will make sure no one misses out during family gatherings. Down the hall off the living room you will find two guest bedrooms, one with a queen bed and the other with two twins. These two rooms share a full size bathroom. The laundry room is also on this level. Take a walk up the incredible log staircase to the loft. The perfect place for kids to hang out and watch TV, the loft also has a futon and oversized chair for additional sleeping. On this level you will also find the master bedroom with a queen bed and attached master bathroom. 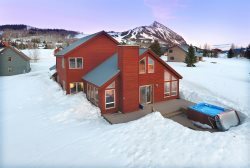 Outside you will find large decks, a gas fire pit, a HOT TUB, and the path to the Gunnison River in your backyard. There are private bridges to the river and the hideaway cabin, where you can sit and read for hours. With enough room for an RV in the driveway or a large boat for the local lakes, Fisherman's Paradise might be paradise for more than just fisherman! We could not be happier with Iron Horse Property Management. You saved our vacation! Our original plans fell through and we could have lost the complete vacation but you worked with us and made it possible again!!! I realize you did not have to accommodate us but you did and we are very grateful. The house and property were PERFECT! The setting was perfect for us as far as location. We LOVED the hot tub even on the coldest night! I can only imagine how beautiful it is in the summer. The house was so clean and there wasn't a thing we needed that it didn't have. Plenty of towels and even things like soap, etc. were available! Wonderful, everyone was friendly and courteous. The property was wonderful, clean and very accommodating. Beautiful home and property. Lovely property with everything you could ask for including a river vista! lovely property and well maintained. The proximity to the Gunnison River is a major plus. Our family was most impressed by the comprehensive selection of available accessories (e.g., table service, washer and drier, linens, hot tub, fire pit, etc.). Our 7 year old grand daughter was delighted by the discovery of the neighborhood fishing pond. She caught 2 keepers one day and on her return the next day, caught and released 3 nice fish. Her father had pinched down the barb on her hook to increase the success of release. For a 7 year-old, it was high adventure. Absolutely perfect, friendly and courteous we had no problem at all. The property was exceptional, everything was perfect we had a wonderful vacation and will definitely come back again..
Great Cabin Great Location! This was a beautiful cabin that had everything you would ever need. It is on a great spot along the river and the accommodations are perfect it has everything you will need. We had 4 of us staying the week and it worked out perfectly it was very relaxing environment with nice big deck and patio. It looked just like the photos on the web site. It is a great location to get to all the sites and great outdoor actives in the area. If you don't want to cook there are some great places to eat very close as well. The experience was fine as I was able to get timely responses for all questions. The stay was great. The vacation was for my 92 yr old Uncle to see the Mountains again. The weather did not cooperate, but the house was warm and cozy and we had everything we needed. The house was well stocked and very clean. I would stay again for sure. Great house, just as described...our family of six was extremely comfortable...very nice, clean---loved it! As always, you guys are delightful. It was such a nice surprise to learn that Molly had joined your team! Just adore her...great personality, people person, love her! Location was excellent, home was awesome, nothing but good things to say about this rental. We had everything we needed. Look forward to returning to this same rental in the future.